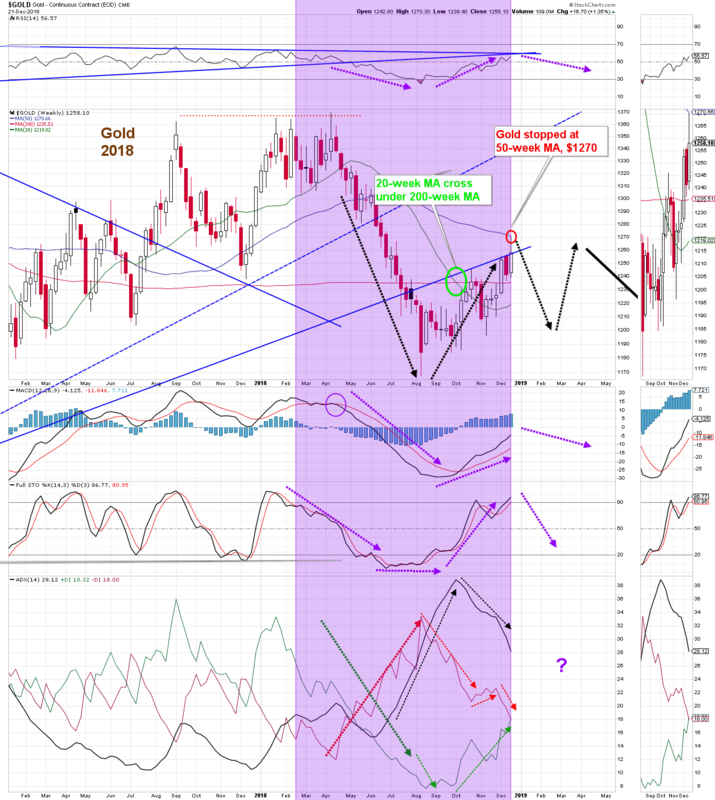 We have been pounding the table (lately, with our foreheads) for some time now about the fact that fear-of-losing and of-missing-out drives the market, and that fundamental economics provides the "scaffolding" for the market. Bear markets start when the scaffolding (fundamental economics) is weak, and the fear of-missing-out (irrational exuberance) is strong and driving the market fearlessly higher. This is nothing like the situation we have today. Corrections happen, within ongoing bull markets, when the scaffolding is solid and the irrational fear-of-losing is driving the market. This is very much like the situation we have today. What is the market worried about? If participants are worried that a recession is about to strike at any moment, then the fear contradicts the facts and is as irrational as it is overdone. We won't go through the list of indicators released over the last two days of the week (we presented a few of them in Friday's update), but suffice it to say that the economy continues to expand. If participants are worried about the Fed raising rates this week, then they are needlessly worried since Powell had telegraphed the hike and the market had already priced it in--75% of it, at least. In addition, the Fed stated they will slow the pace of hikes down to two, from the earlier three in the coming year. On their own, rising rates are nothing to worry about; rising rates are accompanied by rising stock markets until rates get too high. Rates getting too high can trigger recessions, but that level is still 1% above where we are today (chart below). If participants are worried that a partial government shutdown will cause a recession, then they are irrationally afraid; historically, the stock market has not moved very much in either direction as a consequence of shutdowns. The longest shutdown was 21 days during Bill Clinton's presidency in late 1995 and early 1996, a three-week stretch that saw the stock market gain 0.1 percent. The biggest stock market drop during a shutdown was 4.4 percent in 1979 during Jimmy Carter's presidency. Of course, it could be "different this time". If participants are worried about the over-all political situation in the White House, then at first glance, it might seem rational to fear the chaotic and unpredictable actions of the POTUS, but the market has been aware of Trump's character (or lack of) since before his election. Therefore, to say that his actions are now responsible for the demise of the stock market is as valid as to say that his actions were responsible for the rise of the stock market. The stock market performance is not caused by Trump; the market has risen +60% since January of 2016, and one-third of that rise occurred before Trump was even elected. Congress--including its sycophantic and cowardly members--is unlikely to allow their business interests to be destroyed by the Donald. The fear of the White House destroying the economy is irrational. That is not to say that there will be no constitutional crisis as a result of the Donald's actions--there are several possible triggers: the forthcoming Mueller report, the possible firing of Mueller before he reports, the possible firing of Jerome Powell and subsequent loss of Federal Reserve legitimacy, just to name a few--it is just that the economy and the stock market is bigger than the presidency itself, as evidenced by the Nixon and Clinton sagas. During Nixon's time, the stock market had been dropping for 9-months before the Saturday Night Massacre because the economy was already in trouble, in no-small-part due to the oil embargo. The stock market continued to drop after Nixon's Saturday Night Massacre, which was unleashed on October 20, 1973, the day after the oil embargo started, and kept dropping after his resignation (chart below). GDP and PCE dropped for a year before and a year after the massacre (chart below). In Clinton's case, the stock market dropped 19% (the same as the present correction) ahead of the Special Prosecutor's report, but recovered when it became obvious that the economy was not sliding into a recession (chart below). GDP and PCE were steady throughout the Clinton saga (chart below). Today, as Trump engineers his own slow-motion 'Saturday Night Massacre', the economy continues to expand (chart below). We, therefore, expect the bull market to resume in 2019, regardless of any political crisis (chart below). 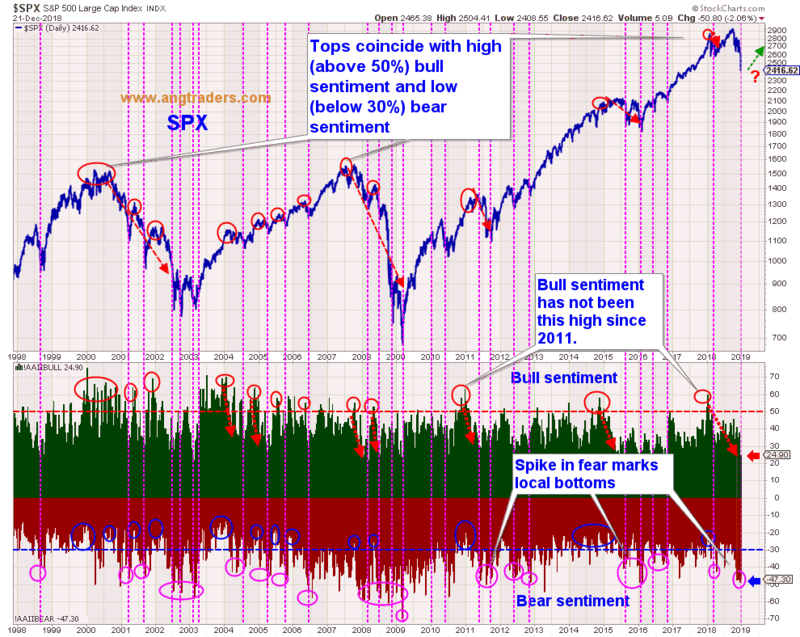 There is no denying the elevated amount of fear highlighted by the AAII survey (chart below). The National Association of Active Investment Managers (NAAIM) exposure index 50-week MA leads market down-turns and lags market up-turns. The average has dipped slightly lower, but the bottoming process continues (chart below). The chart below shows the put-to-call ratio at the daily-scale with the 8-day MA highlighted. The vertical blue dashed-lines mark the up-spikes in the 8-day MA which also correspond to local bottoms in the S&P 500. Since April, these up-spikes have formed a pattern of lower-highs like 2017 (blue solid trend-lines on chart below). That was a gigantic understatement! The price collapsed. 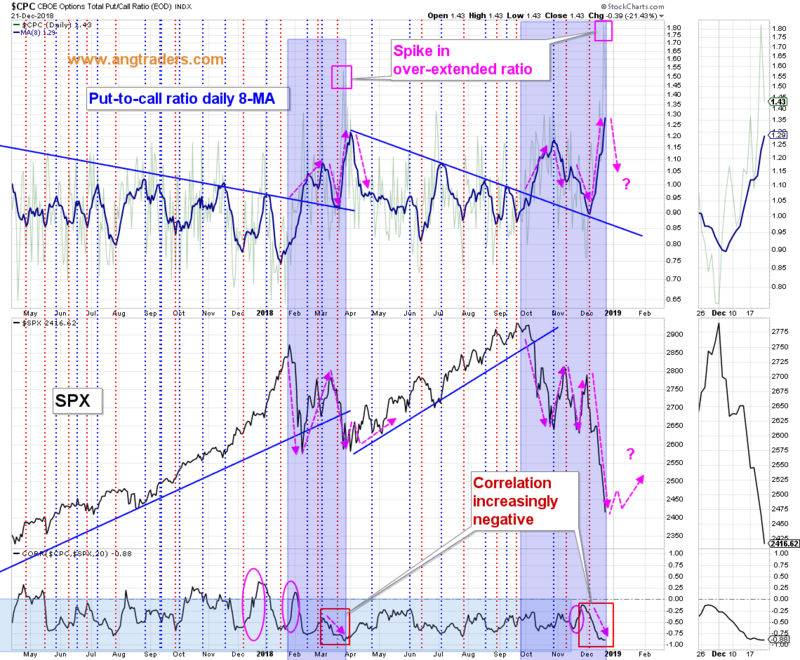 However, the nominal put-to-call ratio spiked to a panic level of 1.80. It would be surprising if we did not get a bounce next week (chart below). 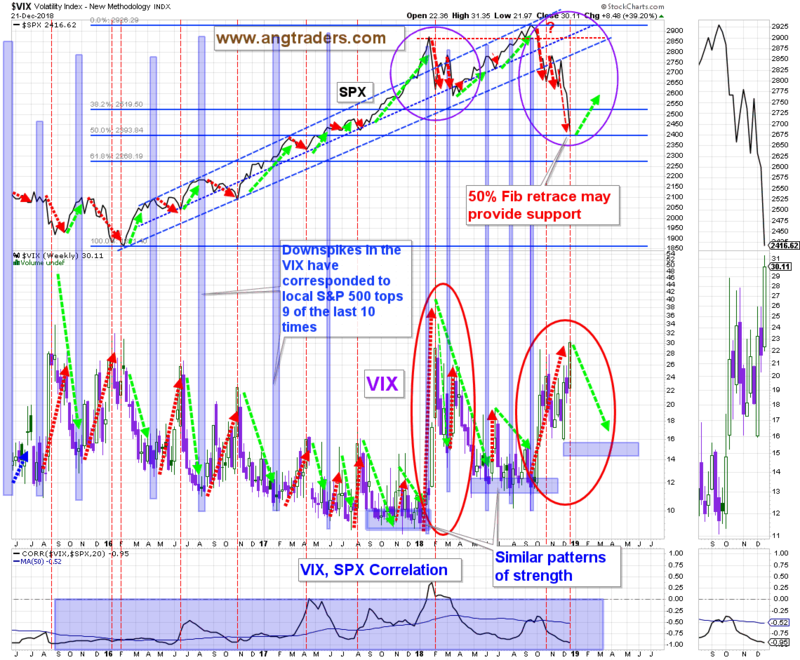 The expected upswing in the PE:VIX ratio did not materialize and the pattern from last March stopped replicating. The ratio spiked down below the up-sloping trend-line and is so over-extended at this point that a local bottom is likely close at hand (chart below). 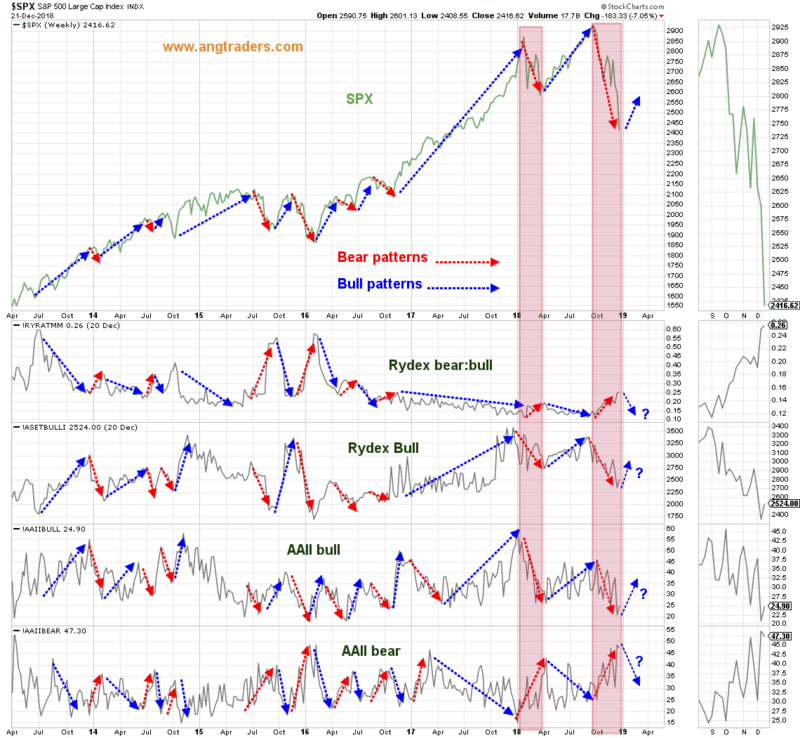 The bear-to-bull asset allocation of the Rydex family of funds, has a strong inverse correlation with the SPX; a declining 36-week MA in the Rydex ratio is bullish for the SPX. 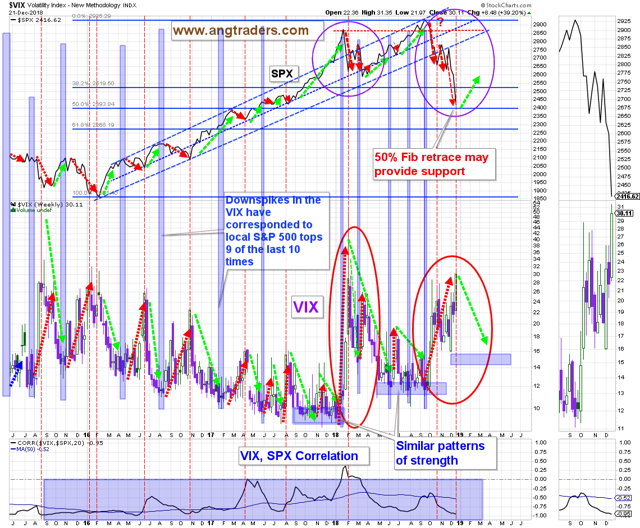 Down-spikes in the ratio, correspond with tops in the market. In other Weekly Summaries, we have pointed out the similarity in trading patterns of the current bull market, with those of the tech bull market of 2000. 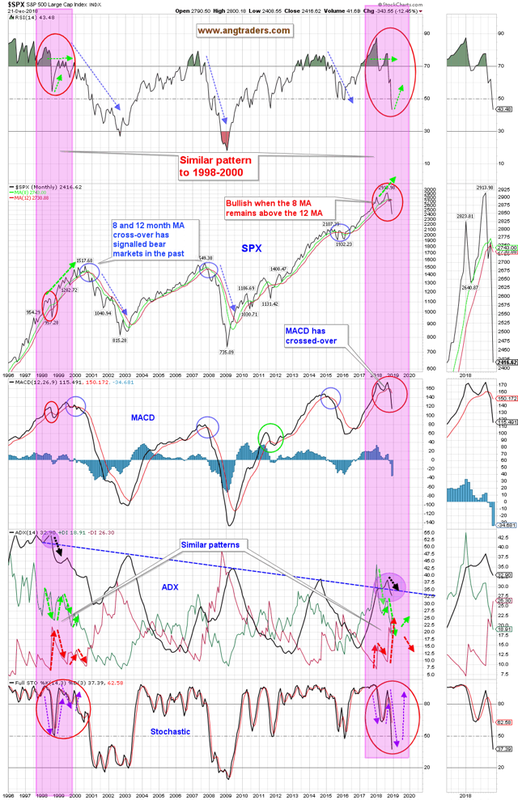 During the later-stages of the tech rally, the Rydex ratio (nominal) made a down-spike early in 2000, but the 36-week MA continued to move lower while the SPX moved higher for another six-months before hitting its second (and final) high, and the Rydex ratio made its second (and final) down spike, after which, the 36-week MA started to rise as the S&P 500 corrected itself into a bear market. 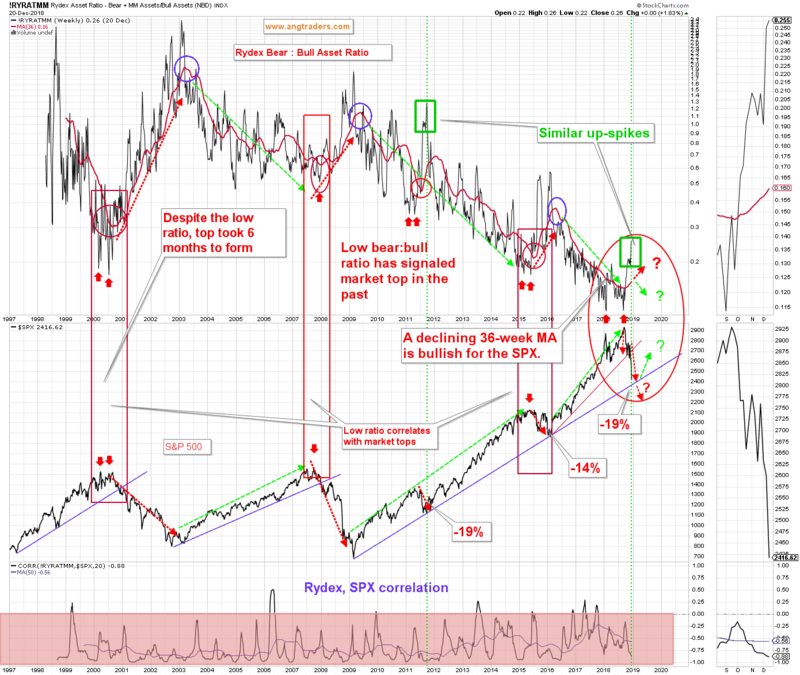 Despite the fact that we have many reasons to think that this is not the start of a bear market, the behavior of the Rydex bear:bull asset allocation ratio is starting to worry us. 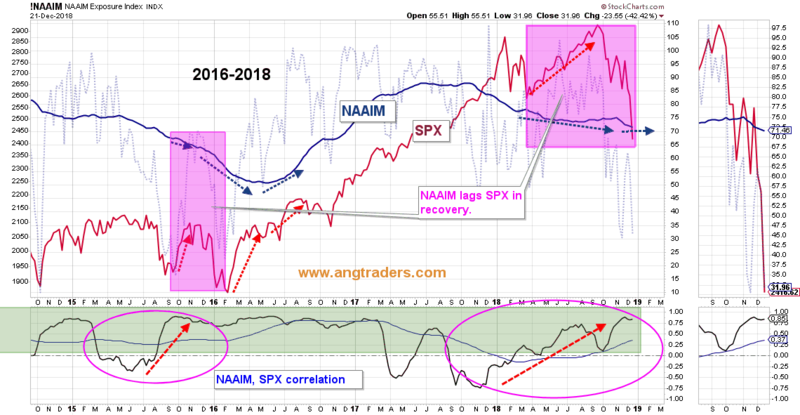 Each time that the nominal ratio value made a double down-spike and the 36-week MA started rising, the SPX corrected into either a bear market (2000), or into a significant local correction (2011 and 2015). That is the situation we are in now; the nominal ratio has formed a double down-spike, and the 36-month MA is starting to rise. In 2011, the market corrected -19%, in 2015 it went down -14%, and as of this past Friday, the market is now down -19% and close to the long-term trend-line in the 2400 area. 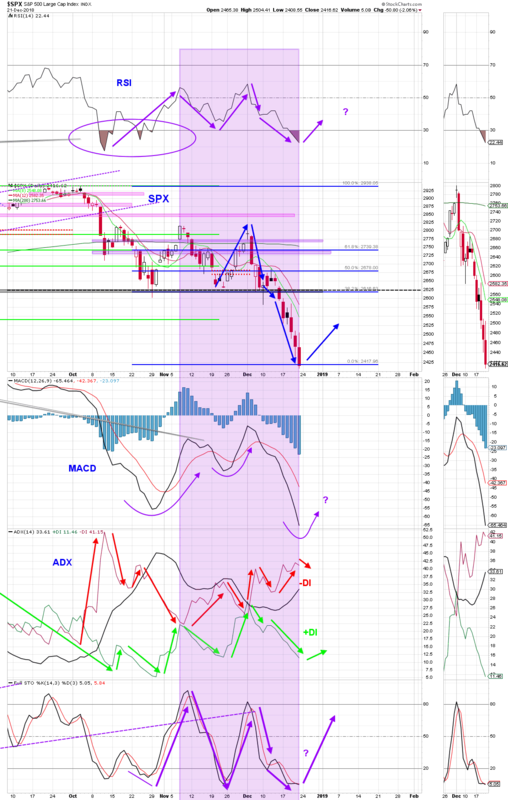 We think that a bounce from this point is highly probable, but a sustained close below 2350 would put the market in a technical bear market, at which point, we would start layering into short positions. 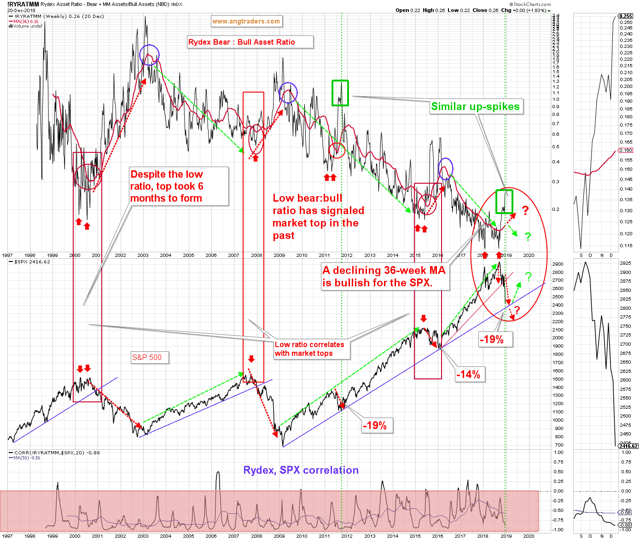 The nominal bear:bull asset ratio continued forming an up-spike very similar to 2011 (green rectangles on the chart below). In 2011, this up-spike marked the bottom of the correction and the same might happen this time. 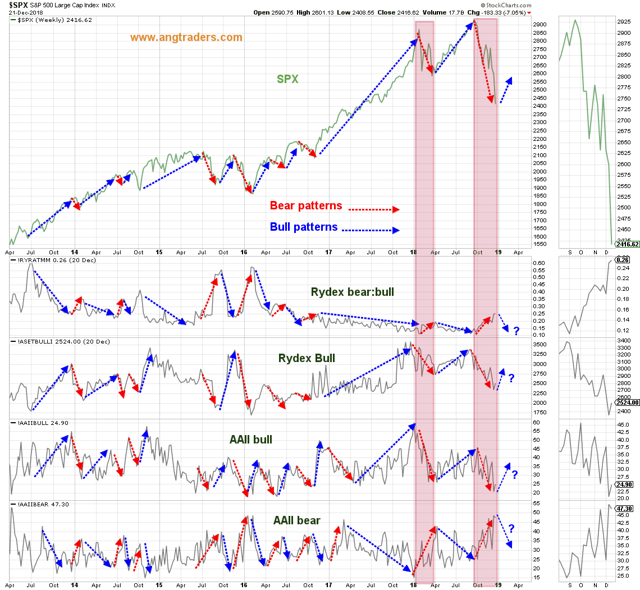 The chart below, shows the bear:bull Rydex asset ratio, the Rydex bull assets, the AAII bull sentiment, and the AAII bear sentiment. 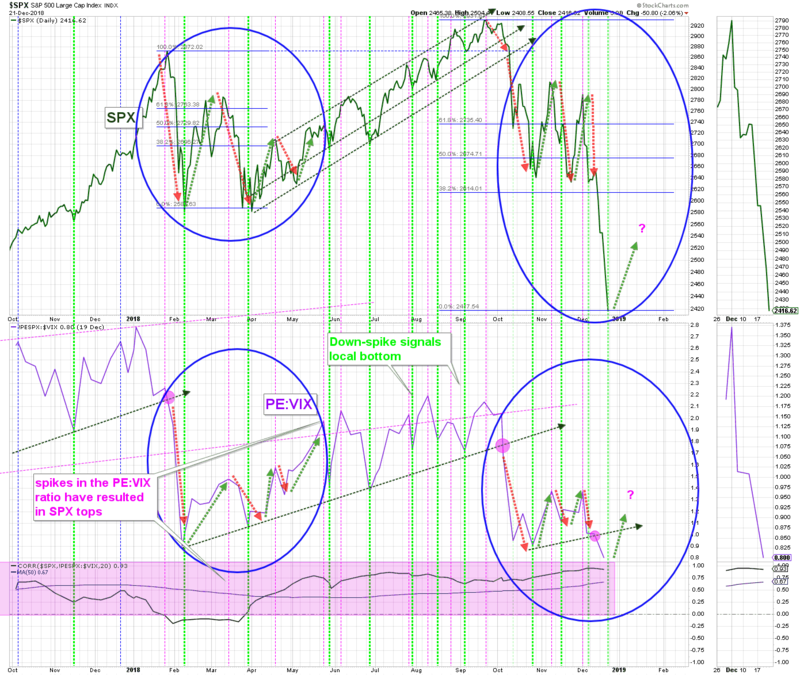 Despite the precipitous fall in the SPX this week, three of the four indicators have started to turn bullish (chart below). 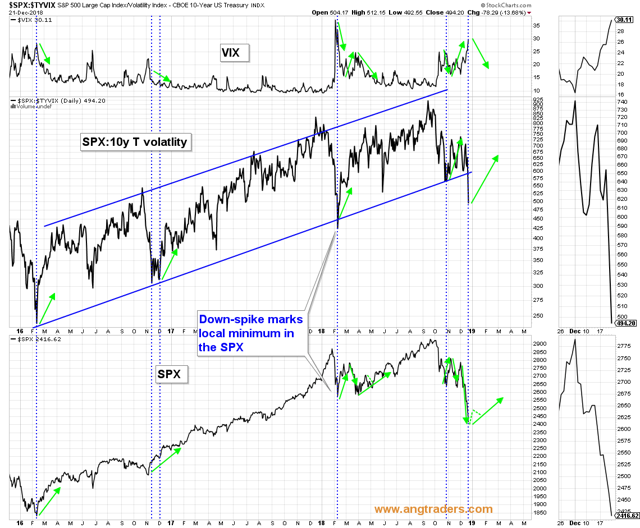 Up-spikes in the VIX correlate with lows in the SPX (vertical dashed-lines below). This week, the VIX made a new high that could signal a near-term low in the S&P 500 corresponding to the 50% Fibonacci retrace of the February 2016 to January 2018 rally. The ratio of the SPX to the 10-year Treasury volatility (SPX:10y T volatility) demonstrates a pattern where down-spikes correspond to local minima in the S&P 500 (vertical blue dotted-lines) and to up-spikes in the VIX. 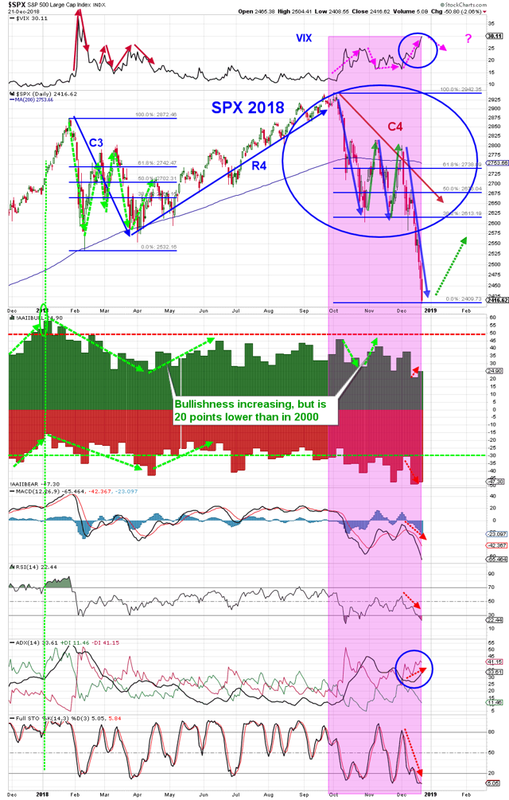 The bottoming process continues, but looks close to completing (chart below). The C4 correction pattern has lost some of its similarity to 2000. As opposed to 2000, the price has spiked lower on the third wave down, the VIX has spiked up, and the -DI has risen. That reduces the utility of the pattern, but does not completely negate it. 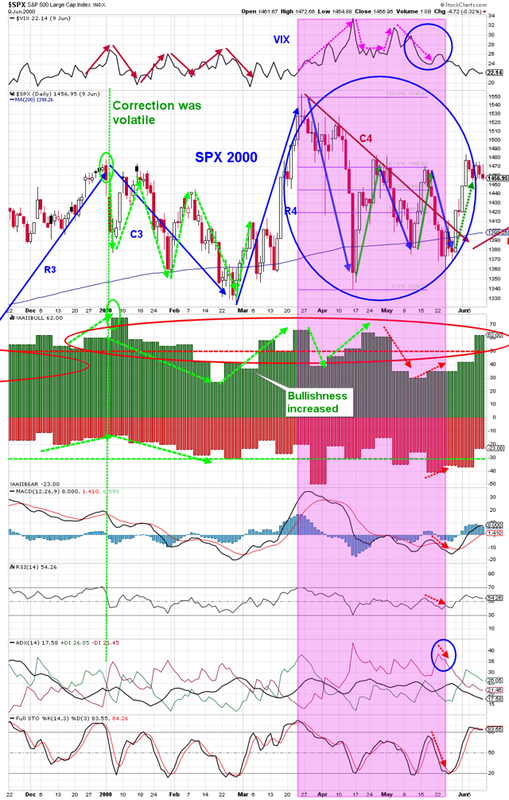 At this point, however, it has little predictive value other than suggesting a bounce soon (charts below). The pattern of the PE, however, continues to match up well (charts below). The long-term technical picture continues its similarities with 1998-99, but the indicators have made exaggerated moves compared to 1998-99. Surprisingly, the 8 and 12-month MAs have not crossed over. They remain thirteen points apart despite the severe price-drop. This supports the idea that this is a correction and that it is almost finished (chart below). 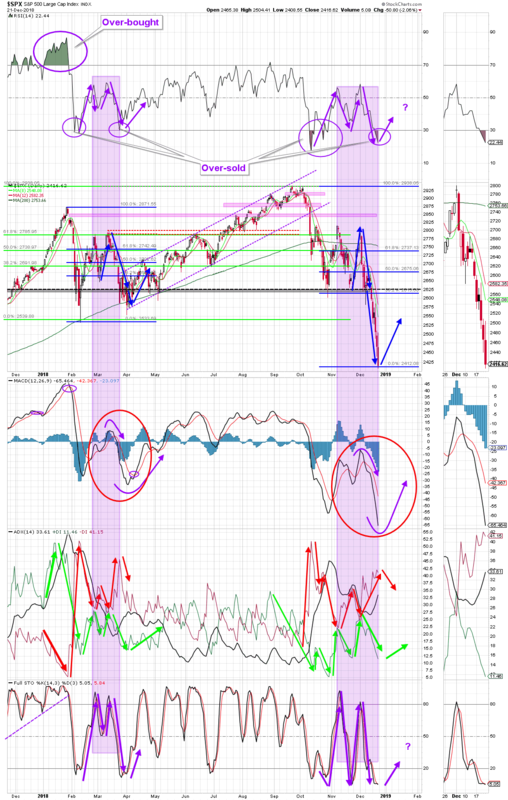 Regarding the short-term technical situation, the indicators sank deeper into over-sold territory making it increasingly likely that a bounce will materialize soon (two charts below). Corporate earnings have risen by more than 20% this year and are forecast to grow by between 7% and 9% in 2019. The drop in the stock market implies a reduction in earnings of about 9% next year. Is that a reasonable expectation? Before bear markets start, the 10y-2y Treasury rate inverts 6 to 18 months ahead and the unemployment rate starts rising. At the current pace of Fed hikes, the inversion would not occur until the end of Q1 of the coming year and with a bear market no sooner than 6-months later. The unemployment rate has not started rising yet. A bear market is not likely to start in the next six months (chart below). Net yield (SPX dividend yield minus 6-month Treasury yield) stands at -0.45 which is slightly higher than it was a couple of months ago, reflecting the lower equity prices and resulting in a higher dividend yield. The net yield tends to flatten, then rise for several months leading up to a market top. 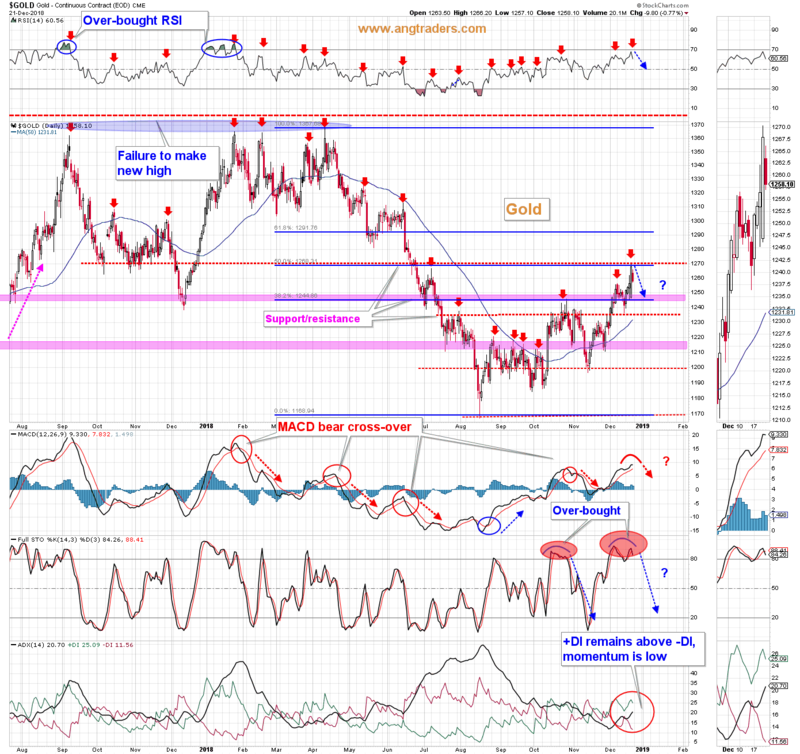 Another couple of months of flattening would raise some flags, but not at this time (chart below). We expect a bounce, but we also expect volatility to remain an issue as the new year starts. 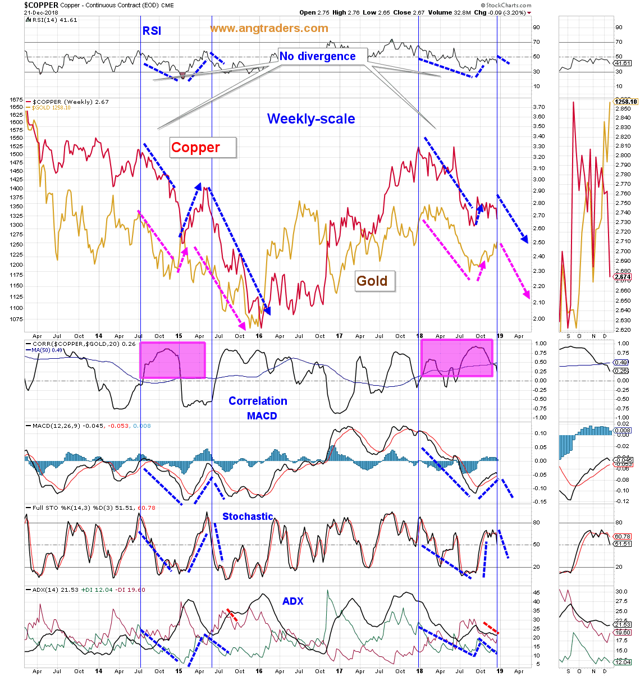 Copper and gold traded in opposite directions this week (gold up, copper down), but the technical pattern from 2015-16 continues to replicate. 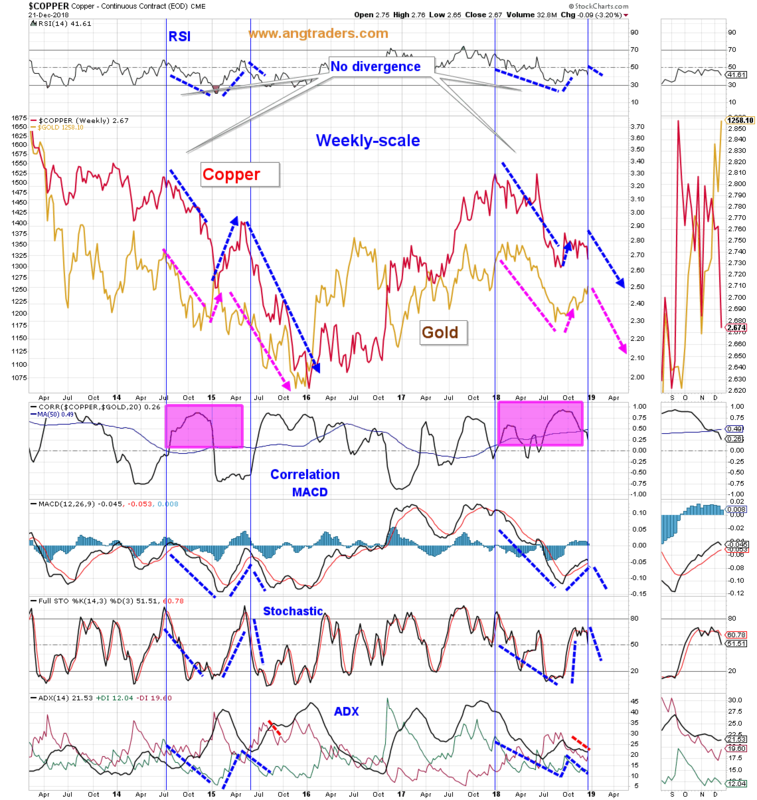 In the medium term gold is likely to trade down along with copper (chart below). The trading pattern from 2013 continues to replicate. This week, gold's rally was stopped at the 50-week MA ($1270) and, if the pattern continues, gold will display some weakness this coming week (charts below). Technically, gold is close to being over-bought with the RSI turning back from the 70 level, the MACD starting to converge, the stochastic is above 80 and starting to drop, and the ADX is neutral since even though +DI is above -DI, the momentum is low. Gold was turned back by resistance at $1270 which is the 50-week MA and the 50% Fibonacci retrace of the April to August correction. The next support is at the 38% Fib retrace ($1245-$1250). Despite the Fed raising rates, the dollar and treasury yields have both fallen. 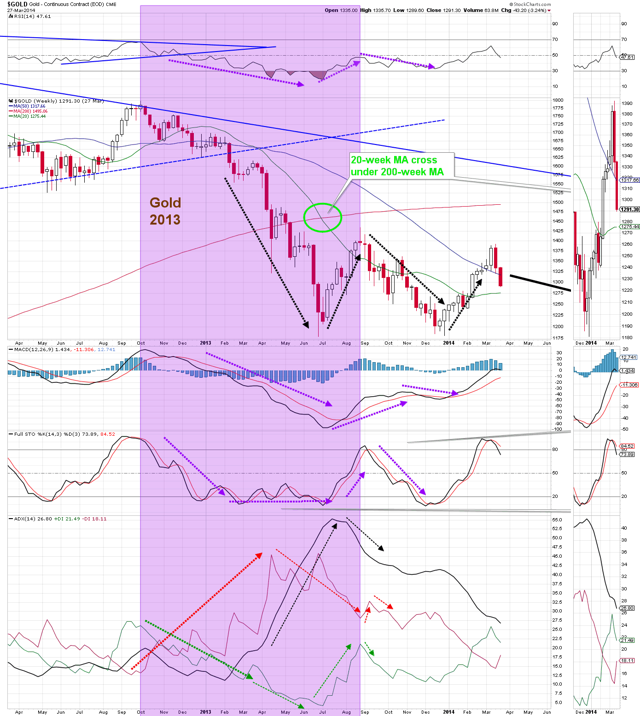 This is part of the 'fear trade' that is in play at the moment. We believe that most of the fear is irrational and will eventually dissipate, but it could take some time for confidence to return to the market. 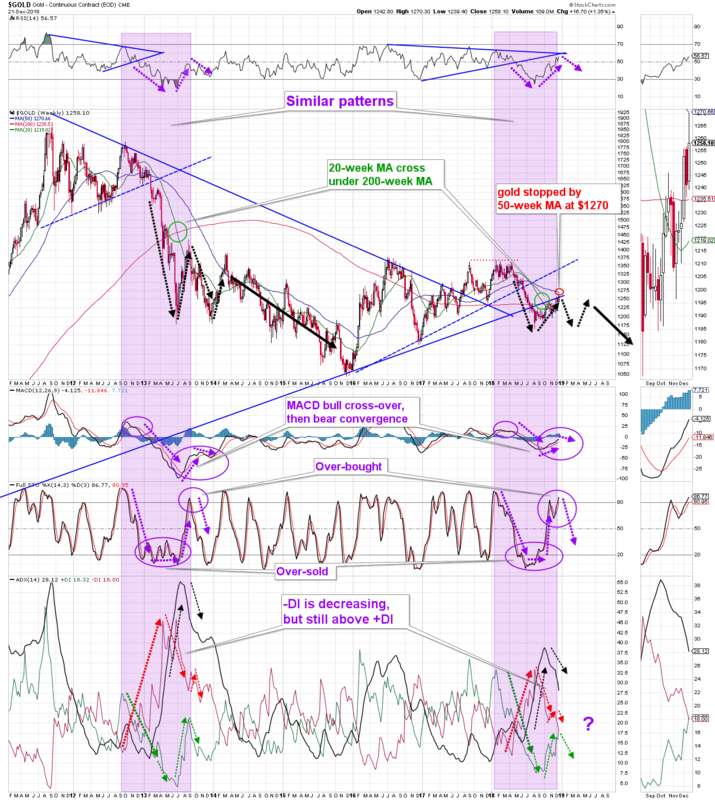 In the meantime, other than a short-lived bounce in confidence, it is likely that the bid for gold will continue until investor fear settles down (chart below). The inflation protected etf (TIP) is once again trading with a positive correlation to gold. 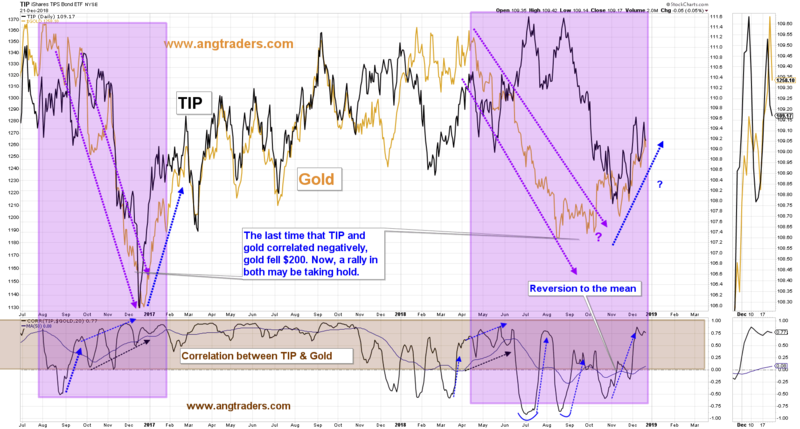 This is similar to the trading pattern at the start of 2017 and could result in continuing strength in gold (chart below). Overall, the most likely scenario is that gold will trade sideways-to-slightly-higher.